Today is International Women's Day, and I just wanted to say that I think women are pretty amazing. There are 450+ women in my Mamas Facing Forward group - juggling pregnancy, motherhood, and chronic illness all at once - and learning to find strength from these experiences. But it's not just these women that I find so wonderful - it's also their mothers, sisters, daughters, and friends who help them figure out how to keep facing forward on a daily basis. So when Healthline asked me what it would be like if the most important woman in my life disappeared for one day, I didn't hesitate for an instant! The most important woman in my life is certainly my mom, who has always been there for me. 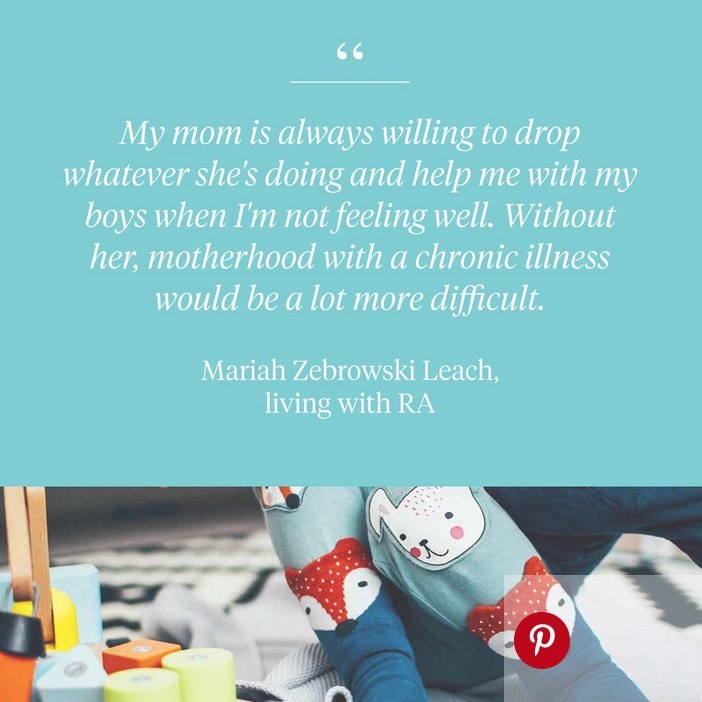 These days, when my RA flares, I sometimes struggle to take care of myself — let alone my two little boys, ages 2 and 4. My mom is always willing to drop whatever she's doing and help me with my boys when I'm not feeling well. Without her, motherhood with a chronic illness would be a lot more difficult. Thank you so much, mama, for being the most amazing woman in my life!! Check out some other incredible women in Healthline's article: A Day Without Her. I am mostly just hoping Sheryl does not find out about this notion of a day without women. I would be in serious trouble. Unfortunately, that pesky TV remote will not stay hidden. The television may be needing repaired later, let's face it when a man has a hammer every TV looks like a hammer.